1. The government of Muammar brought the Libyan government from poverty and debt, to prosperity and debt-free status. Note: The United States and Europe are all currently in a debt crisis that could destroy the entire monetary system. 2. Before Gaddafi, literacy in Libya was only 10%. 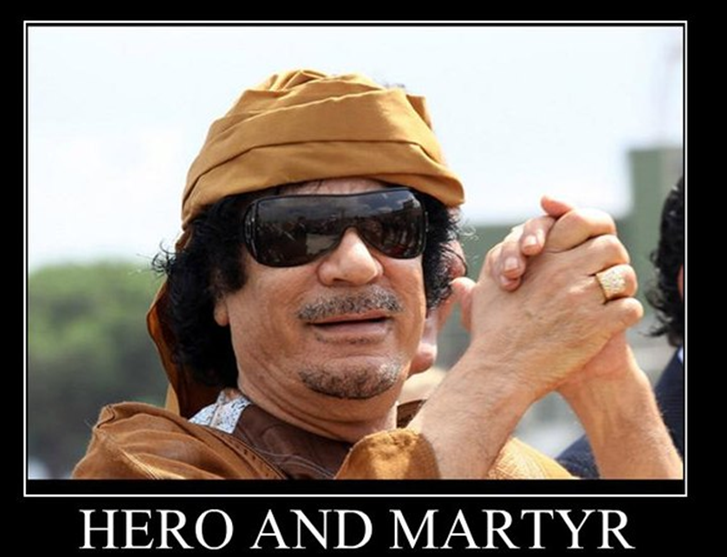 Since Gaddafi’s leadership, literacy has risen to 87%. 4. Education from grade school through to college is free in Libya. Meanwhile, students in the United States are sitting on student aid debt time bombs. 5. Healthcare is free and Libyan pharmacies and hospitals are comparable to high-quality European facilities. 6. Libya ranks No. 53 on the United Nations Index of Human Development. 8. Libya gives free land and seeds to anyone who wants to farm that land. 9. There is virtually no homelessness in Libya as everyone is given a home. 10. Women in Libya have equal rights, not only as a philosophy, but in practice. 11. Under Gaddafi’s oil-revenue-sharing program, each Libyan gets $500 (Dollars) deposited into his or her bank account each month. 12. For any medical care, operations, or health treatments that are unavailable in Libya, the citizen is given full expenses for travel, treatment and accommodation abroad to wherever is required for the treatment to be given. 13. On marriage, each couple is gifted $60,000 to do with as they please; furnish their home, take a holiday, honeymoon, buy car, etc. 14. Libyans have a direct participatory democracy based on People’s Conferences that puts other “democracies” to shame.No other country in the world does this. Yet they say there was no democracy in Libya. Prior to Qaddafi revolutionary re-making, Libya was a large US military base used for bombing trainings. Libya was home to the largest US military base in North Africa. This is what they mean by peace: let your country be used by a nuclear-armed state (that previously used them on civilians and which justifies this horrendous act to this very day) to practice bombing targets while you spend your time partying.